This How To was created post fitment. 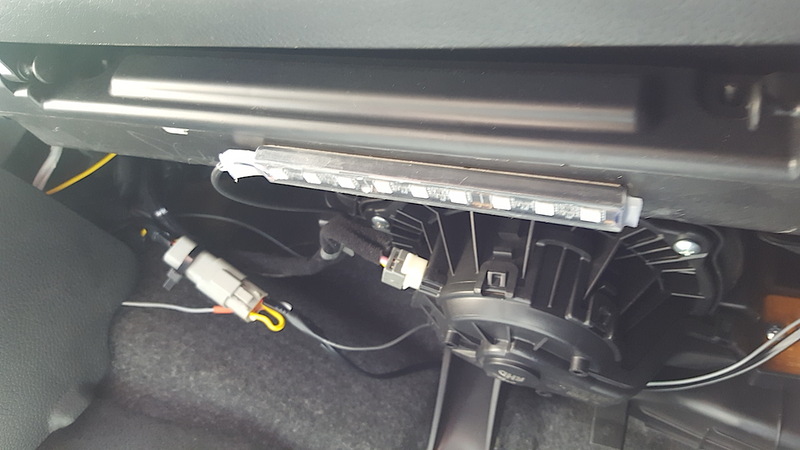 After checking various forums and online videos, I discovered that there was not a lot of information out there on the fitment of aftermarket footwell lights for the i30. 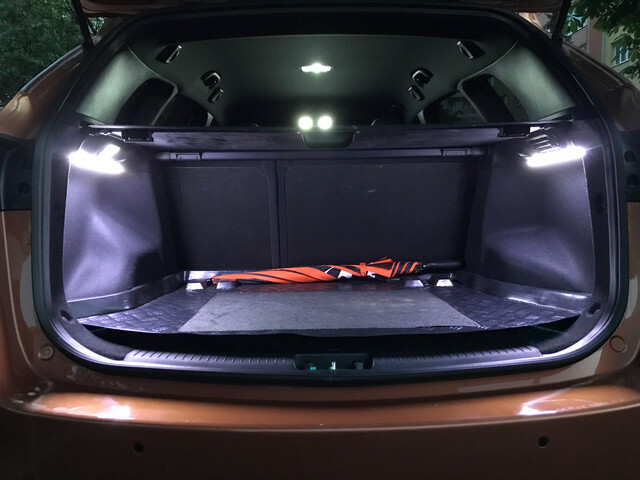 Others had OEM kits fitted, and there was a Hyundai fitment guide that was posted on this forum, but as I did not want to spend big bucks for the original kit, I opted to try fitting aftermarket LED’s myself. I wanted them to fade in and fade out with the roof lights, and not be on all the time, or only on with the headlights. With some circuit testing, I found this was possible. Posts on the subject implied tapping into a positive feed from the dome lights, but I found that it is the negative/ground circuit from the dome lights that controls the fading. I hope you find this guide useful, and if you are successful in fitting your own, share your results. I’m sure others would like to see your handy work. 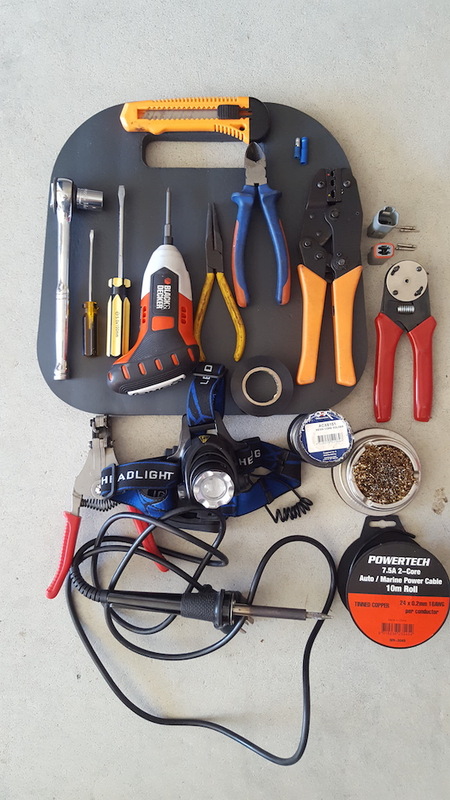 I managed to purchase this set for under AU$10.00 delivered. They took 3 weeks to arrive, but worth the wait. They come with a cigarette lighter socket end for power, but I just cut the 4 LED wires where they joined into 1, and discarded the lighter socket. Remove the lower door plastic cover (pictured between the arrows). Just get your hands under it from the inside and pull. It pops out easily. Pull the door seal away from the A pillar, and all the way along the bottom to the B pillar. The A pillar cover on the left hand side (of my RHD car) is the trickiest to remove. 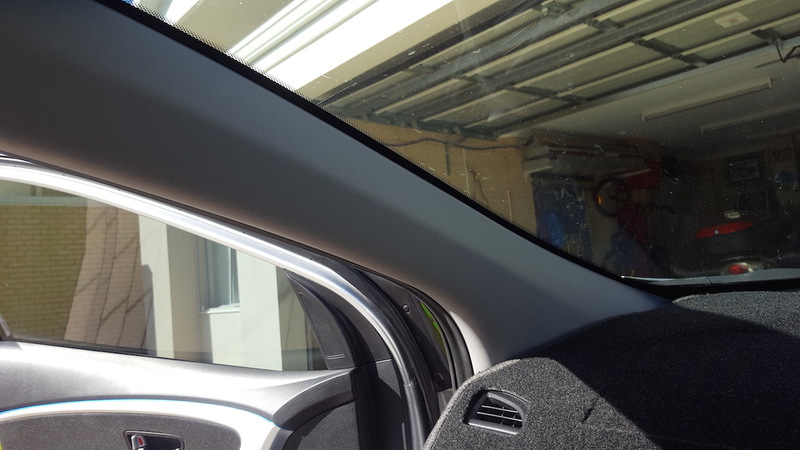 There is an airbag on the pillar, but I did not have any issues when removing the cover. Pull the top of the panel inwards, and you will see two clips, 1 white and 1 green. The white one should just pop out, but the green, which is on a slide (you will see what I mean) needs to be removed with the long nosed pliers. Using the pliers, grip the flat of the green clip and rotate the clip 90° and it will release from the cover. Remove the kick panel by getting your fingers behind the panel at the firewall end. Pull out towards centre console. After it pops the clip, the panel needs to be unclipped from near where the door seal was. 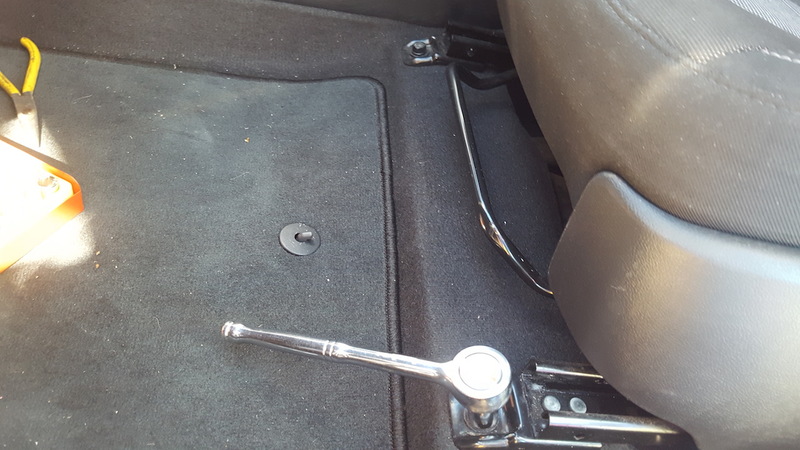 There are wires that need to pass from the left side of the car to the right, and vice versa. I removed the centre console panels by the firewall, and ran the wires between the console and firewall. Use a small flat blade screwdriver to pry out the screw cover and remove the screw. Using a Phillips head screwdriver , unscrew the centre of the clip (don’t apply pressure when turning), then grip the clip and pull out. With a little wiggling the panel will come out. Repeat for the other side. The RHS panel is next to the foot rest. I managed to remove the panel without having to remove the foot rest. Ok. Panels removed, now the wiring. As mentioned earlier, it is the negative (-) feed that is obtained from the roof light wiring. 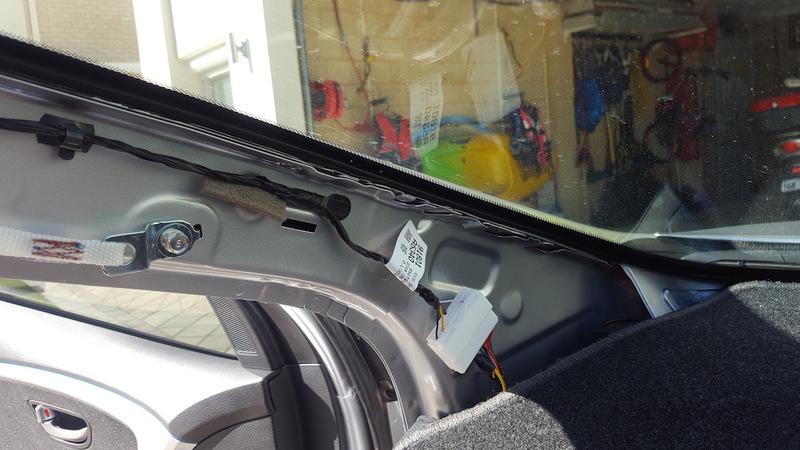 I was going to splice into the wire at the roof light (as this is where I did my initial circuit testing) and run the wire down the A pillar, but I did not want to interfere with the air bag deployment. 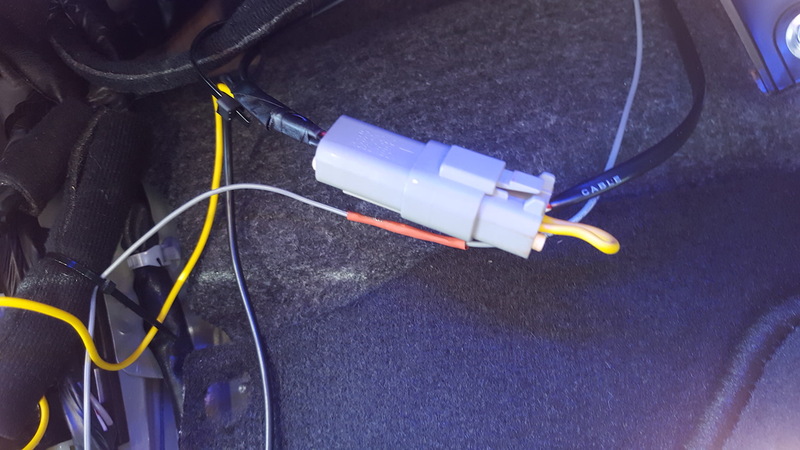 I traced the wire down to a connector on the A pillar, by the dash. This is where I spliced into the negative. Separate the 2 halves of the connector. 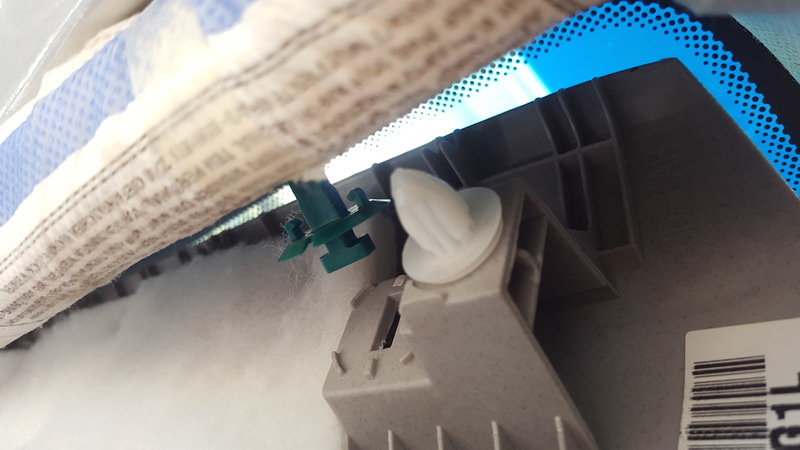 I removed the clip from the A pillar that holds the connector in place. This was to get better access to the wire. 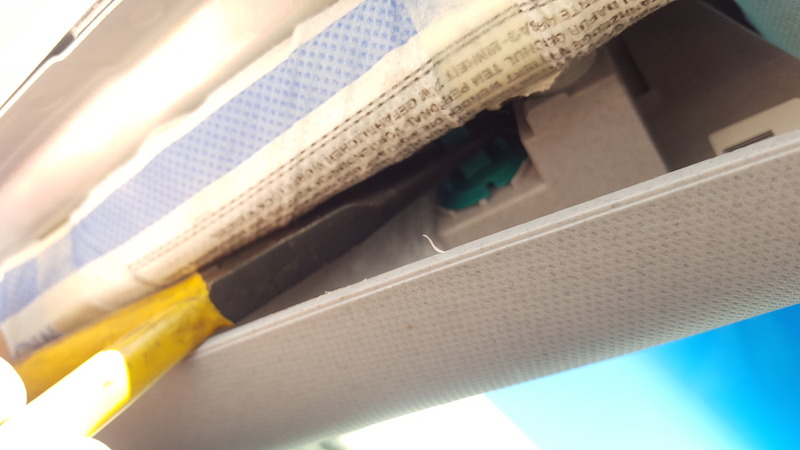 I used a small flat blade screwdriver to squash the tabs that hold it in the pillar. I’m sure you’ll work it out. The yellow wire in the picture is the one you want. I think it’s the fourth hole in, from the door seal side/inside row of holes. You can use Scotch locks or your connection method of choice to connect another wire to the yellow one. I don’t like Scotch locks, as from experience I have found that they can either cut strands of wires (weakening the connection), or not contact the wires at all. I chose to splice into the wire by cutting the insulation around the circumference of the wire at 2 points. 1 cm apart. Then cut away a section in between the cuts, and peeling the rest of the insulation off. Be careful not to cut the copper wire strands. Cut a length of wire long enough so it will reach from the connector to the internal floor (I used yellow wire I had lying around). Strip 1 cm of insulation from the end of the wire, twist it around the exposed wire from the connector and solder. Wrap with insulation tape. 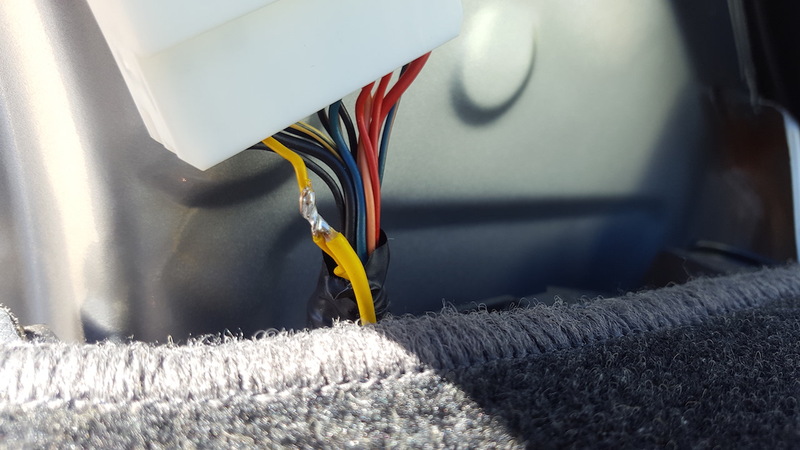 Then feed the newly soldered wire between the A pillar and the dash, down to the floor, following the harness that runs from the connector. Re-clip to the A pillar and re-join connector halves. After cutting the cigarette socket end off the LED wiring I was left with 2 long and 2 shorter wires with the LED strips on the end. The shorter ones were used for the front, and longer ones for the rear (under the seats). At the rear of my front seats, there is a flap (of carpet type material) at the bottom that folds up under the back of the seat. This is where I attached the LED strips. Have a look at your seats for the best placement. 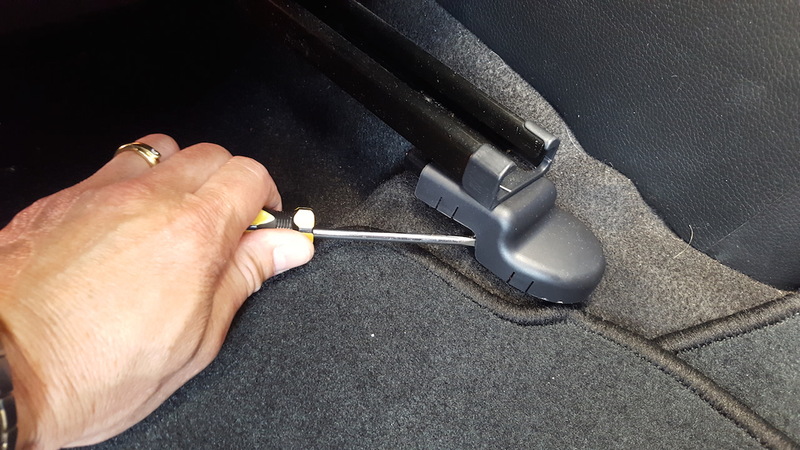 Slide the seat all the way forward and remove the covers that hide the rear seat mounting bolts. Place the small screwdriver behind the cover and pry off. They should just slide off the mount. Slide the seat all of the way to the rear, and remove the 2 front bolts. 14mm as well. Tilt the seat backwards and rest it on the back seat, to expose the underside. If you’re as lucky as me, you will find money hiding under there. 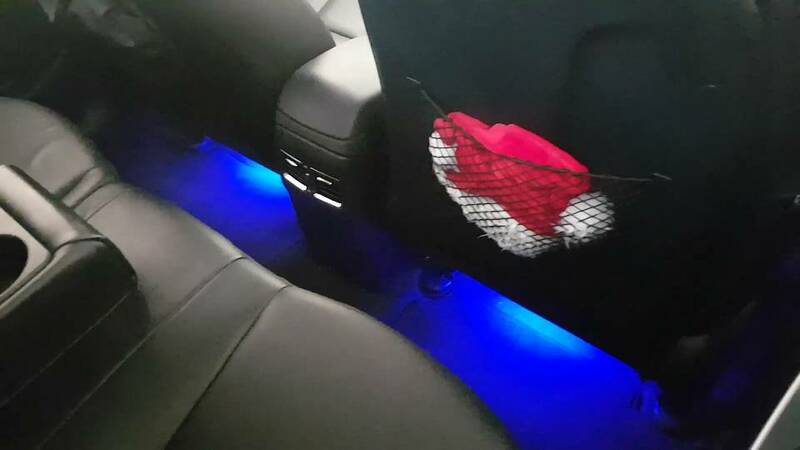 Feed the LED strip under the carpet from the outside to the inside where the under seat vents are. Pull through enough wire so that the strip can be attached at the back, and the wire cable tied to the existing wiring under the seat. The LED strips have 3M tape on them. Peel off covering and stick your LED strip to the rear underside of the seat. Cable tie/tape wire to existing cabling so it’s neat and out of the way. Bolt seat back in reverse order, and slide rear bolt covers on. Repeat process for other seat. Run the rear LED light wiring to the front kick panel area, and cable tie/tape to the existing loom that hides under the covers. Fit the front LED strips. 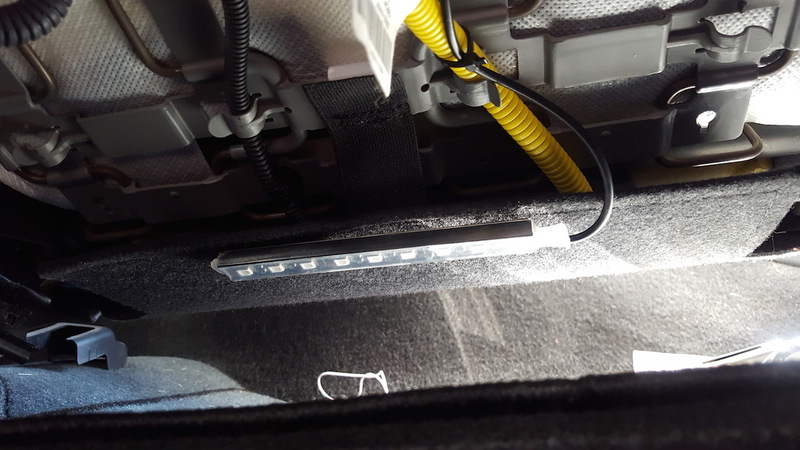 The LHS LED strip I fitted to a flat area under/behind the glove box. The RHS LED I attached to a module under the dash, in front of the steering column. I have made up a wiring diagram to hopefully make my written instructions make sense. At the LHS kick panel, strip off the insulation and join the negative wires from the LED Lights to the negative wire you fed down from the A pillar. Strip some insulation the positive wires from the LED lights and twist together. Run a twin core cable from the LHS to the RHS between the firewall and the console. Make it long enough to reach the kick panel wiring on both sides. On the LHS, the joined negative wires need to be connected to the negative on the twin core wire you fed across the other side. Join the positive from the twin core, to the LHS LED positive wires. 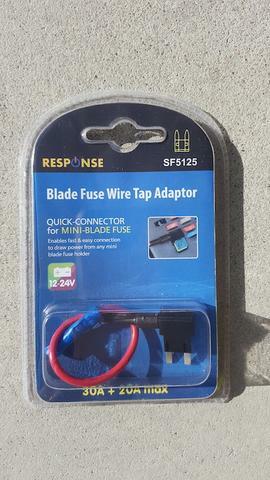 I used Deutsch plugs for my connections, but you can use spade/ bullet connectors or solder the wires together. Just make sure you use insulation tape to cover all connections. At the RHS kick panel, join the negative wires from the LED lights to the negative from the twin core you passed through from the other side. Join the positive wires to the positive from the twin core you passed through. Still on the RHS, you then need to connect a wire from the joined positives, up to the fuse block. This is your positive feed for all of the lights. I used a fuse tap to get a (+) power feed from the fuse block. You will need a lesser amp fuse for this circuit. 5amps should be fine. So use the original 10 amp fuse for the normal circuit, and put the 5 amp in the socket for the secondary circuit. Join the fuse tap wire to the wire you fed to the fuse block from the LHS positives. Tape/cable tie all wires neatly to other looms out of sight. 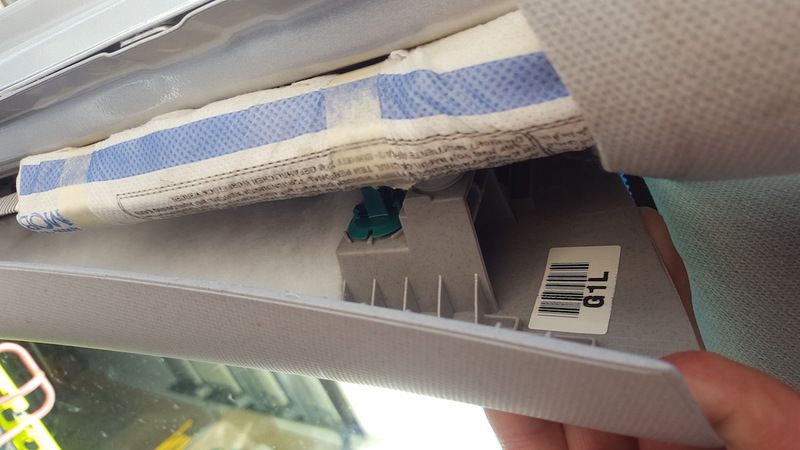 Refit the LHS A pillar cover before reconnecting the battery negative, so you don’t interfere with the airbag. Slide the bottom in by the dash, then use the long nose pliers for the green A pillar clip. Insert it back in the rectangular hole, and turn it 90° to lock it in. Reconnect the battery negative and test. Refit the rest of the panels, clips and the door seal. If you give it a go, and think I have missed anything that may be helpful to others, let me know and I will try to add it in. Nice work, same approach I used on Mrs G's SEAT Cordoba, same blue light, too. Hi Craig, there certainly is an airbag in there. A bit daunting to initially remove the cover, but no problem once the cover is off. There should be one on the other side as well, but i have no inclination to remove that cover to look. I love the look of the scuff plates. Keep your eye on the site, as they have sales quite regularly. Next project is fitting blue "neon look" strips to the door trims. Will post that as well. Takes longer for a how to than to do the job. But its rewarding if it saves others time and effort. What a concise and informative post, great pictures and diagram... you sir are a real bonus to this site. I30 auto diesel to buy in near future! Thanks heaps for the instructions! Gave this a go yesterday and it worked perfectly. I attached the rear lights to the bottom of the seats with velcro as I didn't have faith in the double sided tape. Well done! Looks awesome! Thanks for the images. 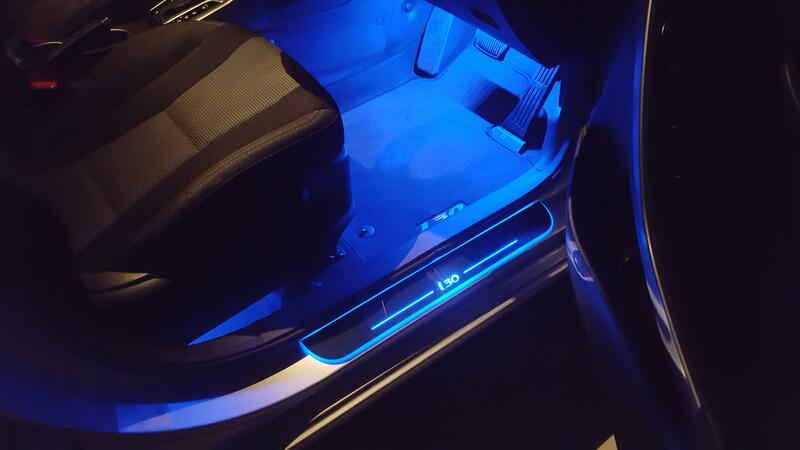 I found this thread while hunting for details of how to add LED footwell lighting into an i30, and this looks exactly what I am after. Thanks for posting it. 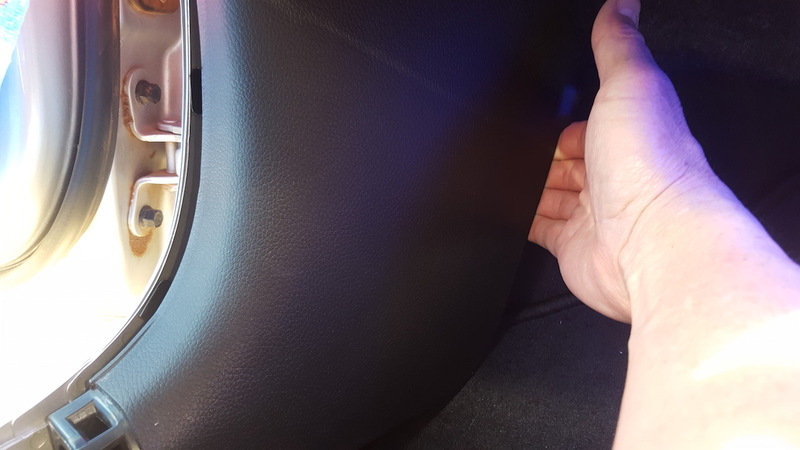 I'm buying a new i30 in a couple of weeks time (UK purchase) and I had been thinking about getting the Hyundai blue-LED lighting kit for the front footwells, but the £150+ price tag seemed really really high even if it included fitting, and the dealer has told me that labour is extra! Ouch, the necessary LED components should only cost a few pounds. 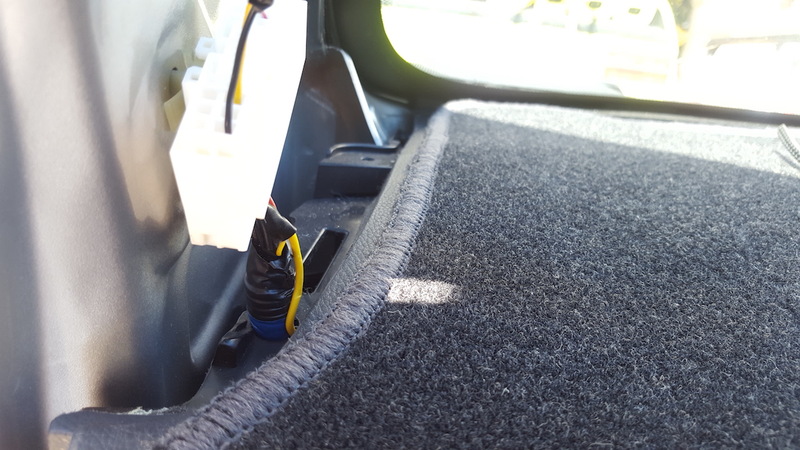 I would only want to do the front set of footwell lights though (driver and passenger under dash, nothing for the rear passenger area) so what would be the easiest two points for me to tap into the wiring? 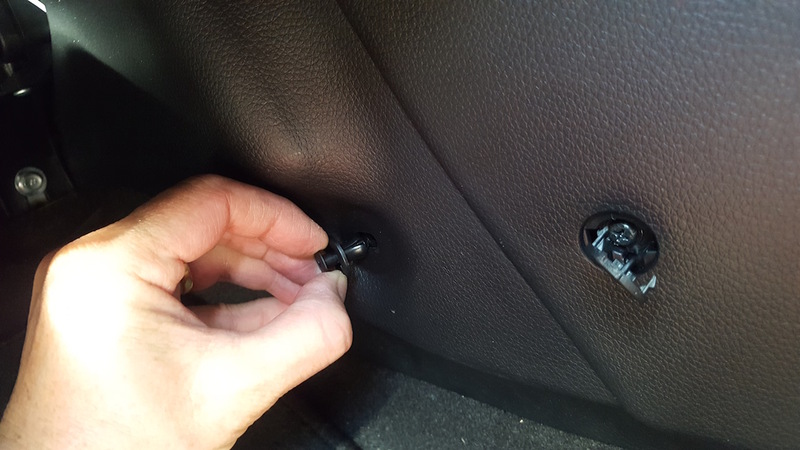 Is there a tap point lower down anywhere, without having to pull the door pillar cover off my brand new car? I'm a bit concerned about unnecessarily messing around with areas containing airbags. I was hoping that since Hyundai sell their own kit, there would be a handy spare tap-in location somewhere under the dash to make the job simpler for them. 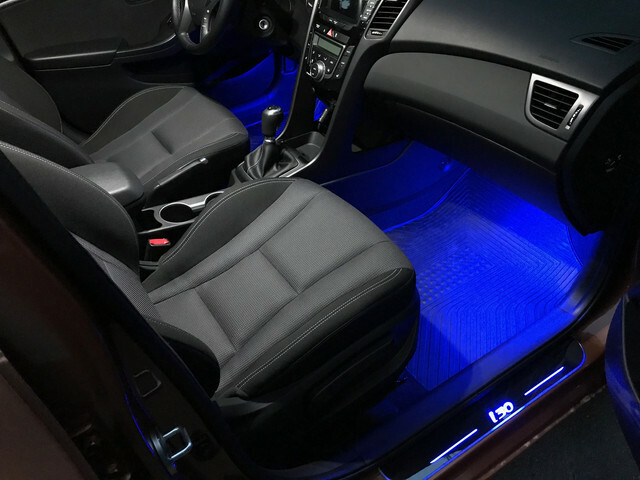 Any advice from those who have done this would be very much appreciated, thinking of this LED set: Top LED Blue Led Footwell/Interior Strip Lighting 2X30Cm Strips: Amazon.co.uk: Car & Motorbike . Thanks. I didn't have to worry about dimming delay on the SEAT Cordoba so the positive was hooked up to any battery feed point and the negative to the positive side of the door switch. 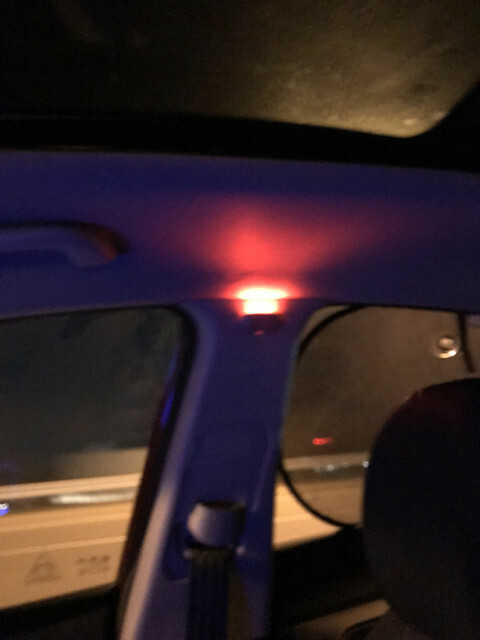 To dim with the courtesy dome light, hook the positive to the high side of the dome light circuit and the negative to any ground. 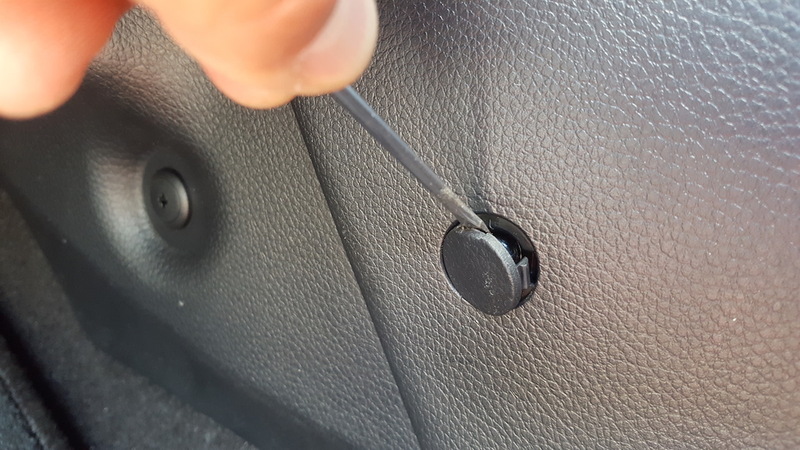 Great step by step thread , I'm going to do the same thing in few days but I wanted the light to turn on once the radio and other lights go on ( at night with low beam headlights) not only when the door open ( if I understood the way it works for you right) which negative wire I should connect my ground to ?!? 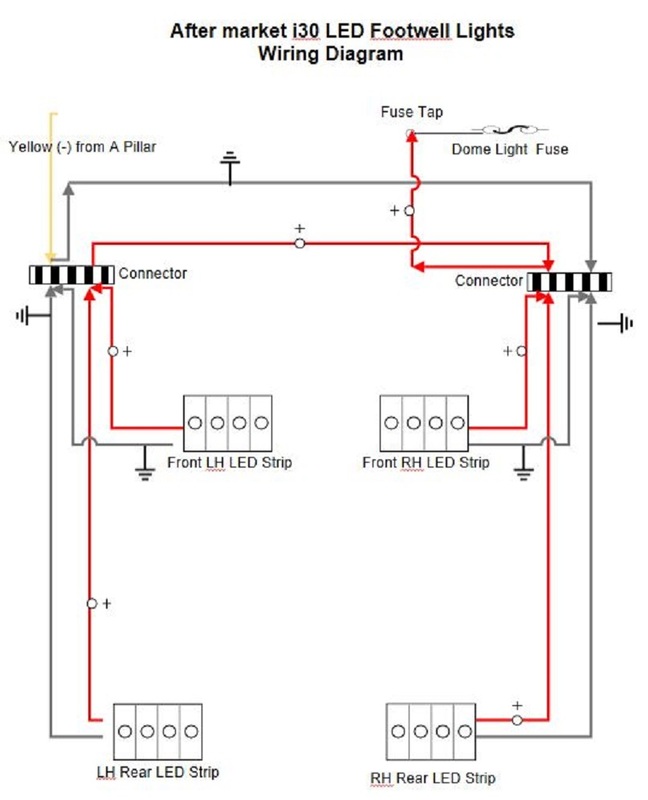 Great step by step thread , I'm going to do the same thing in few days but I wanted the light to turn on once the radio and other lights go on ( at night with low beam headlights) not only when the door open ( if I understood the way it's work right) which negative wire I should connect my ground to ?!? I thought of that but it would get annoying very quickly when you think about it. Do you really want them on every single time your headlights are on? Maybe look at a switch so you still have the option to turn them off. Hi, glad you like the how-to. If you want the lights you fit to go on with the head lights, you would have to tap into the park/headlight circuit. Probably get your power from the positive feed, and earth through any chassis point. You may be able to tap into a positive feed from the dash lights as well. Unsure as to which wires, as i have not had to trace them for this purpose. Good luck with your project. Getting my new i30 next week, and already got some 12V LED strips ready. 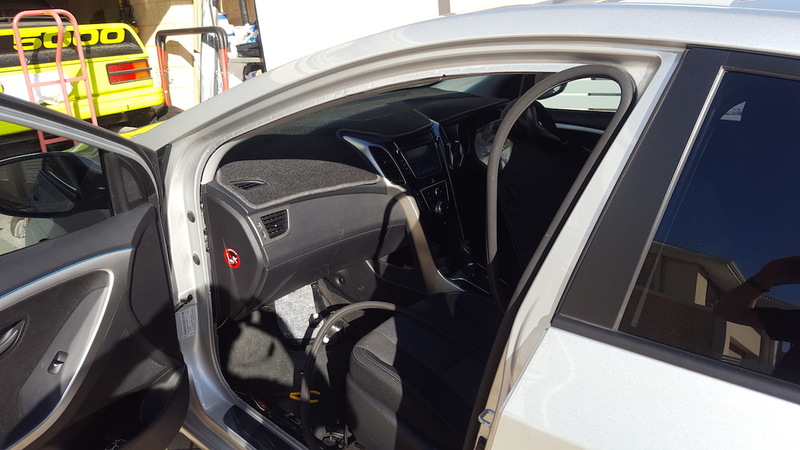 Can I ask whether it's fully necessary to remove the lower door sill plastic cover and the rubber seal around the door frame if I'm only doing the front footwells? Or is that needed in order to get access to be able to pop the front pillar cover off to access the electrical connection? Don't want to do more than I need to potentially wreck my new car. Ok guys so I have been doing some digging and bought the accentglowled cup lights to add it to my mods next week and found this video on installing it in an Elantra sedan and was wondering if it’s going to be the same connections/wires any idea ? 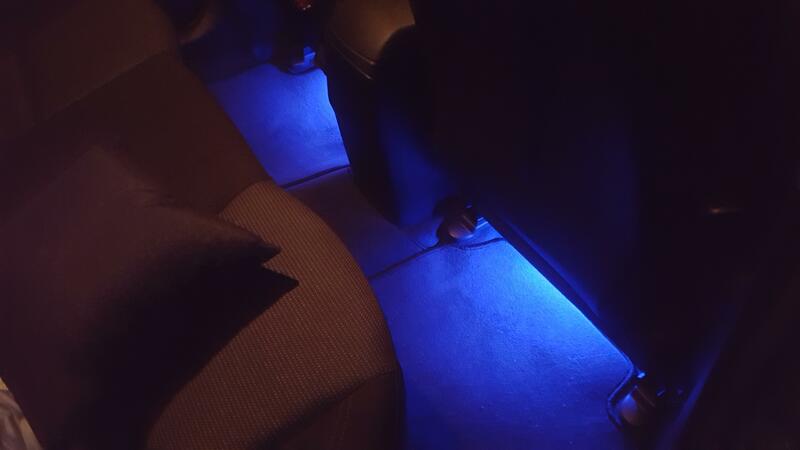 Ok I just finished installing these too mood lights and it’s fantastic I love it the footwell light is coming next weekend but already wired a cable for it. Looks good! Thanks for the photos. 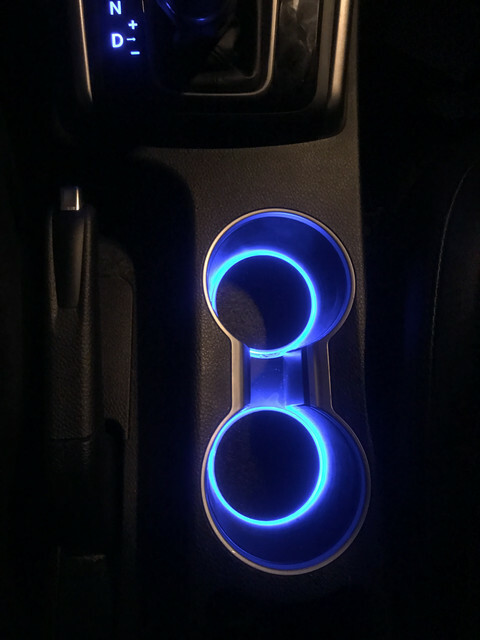 I really like the cup holders LEDs! 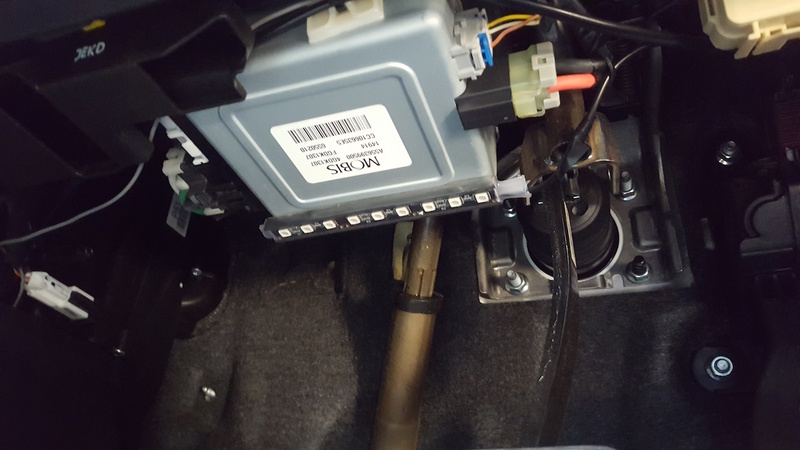 The seller says that the Elantra GT (i30) model is not directly compatible with that holders unit, but I think that only the installation is a bit different. Am I right? 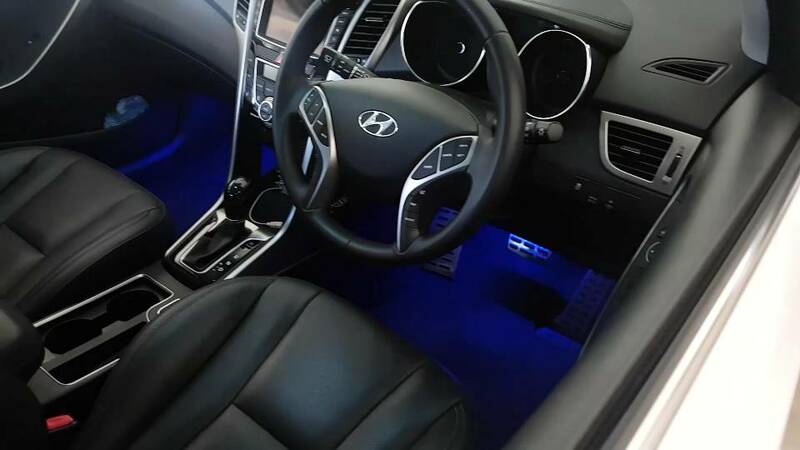 Did you buy the Elantra 2011-2015 cup holders LEDs? Hi Andre, lower plastic cover was removed to hide wiring from view. If you are only doing the front, you could just tuck in behind if necessary. Door seal would need to be pulled down enough to expose the top pillar cover, as that is where you would have to tap into the negative (yellow)wire (which is the interior light dimming circuit). Hello, I installed few LED recently. But I would like to ask, do you know if is signal from door switch installed inside front doors? Probably not? i'm not exactly sure what you are asking? If the lights go on when the door opens, and go off immediately when the door is closed, then they are most likely wired to the door switch. 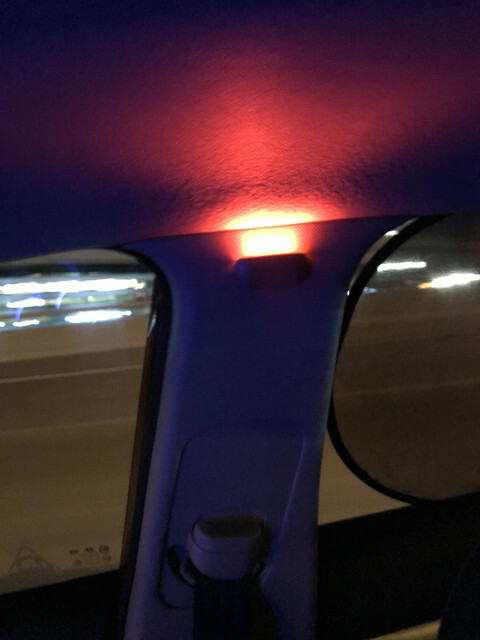 If they go on when the door opens, and fade down with the interior lights, then they would most likely be wired through the interior light circuit. Hi, I would like to install this LEDs. 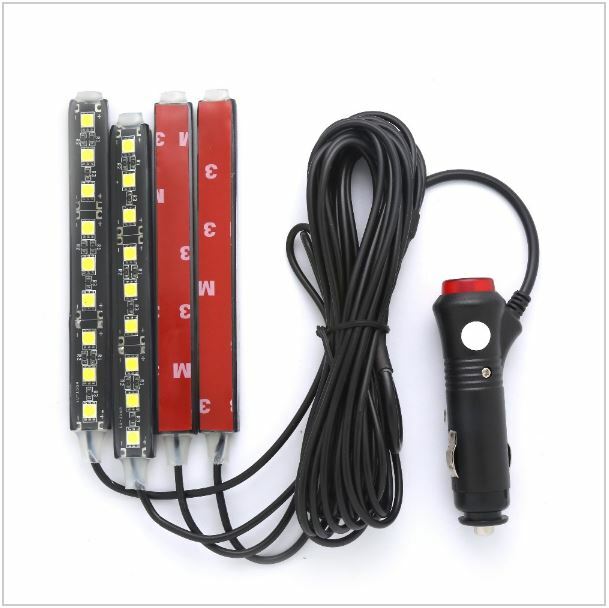 But I am not sure where to connect the LED, becuase I would like to have them to be on only when I open the door. I guess that the door switch signal is not wired in to the door wires.